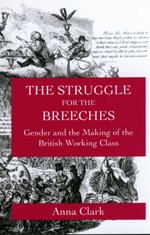 Linking the personal and the political, Anna Clark depicts the making of the working class in Britain as a "struggle for the breeches." The late eighteenth and early nineteenth centuries witnessed significant changes in notions of masculinity and femininity, the sexual division of labor, and sexual mores, changes that were intimately intertwined with class politics. By integrating gender into the analysis of class formation, Clark transforms the traditional narrative of working-class history. Going beyond the sterile debate about whether economics or language determines class consciousness, Clark integrates working people's experience with an analysis of radical rhetoric. Focusing on Lancashire, Glasgow, and London, she contrasts the experience of artisans and textile workers, demonstrating how each created distinctively gendered communities and political strategies. Workers faced a "sexual crisis," Clark claims, as men and women competed for jobs and struggled over love and power in the family. While some radicals espoused respectability, others might be homophobes, wife-beaters, and tyrants at home; a radical's love of liberty could be coupled with lust for the life of a libertine. Clark shows that in trying to create a working class these radicals closed off the movement to women, instead adopting a conservative rhetoric of domesticity and narrowing their notion of the working class. Anna Clark is Associate Professor of History at the University of North Carolina. She is the author of Women's Silence, Men's Violence: Sexual Assault in England, 1770-1845 (1987).